HEK-Blue™ IL-2 reporter cells have been specifically designed to monitor the activation of the JAK-STAT pathway by both human and murine IL-2. These cells were generated by stable transfection of HEK293 cells with the human IL-2Rα, IL-2Rβ, and IL-2Rγ genes, along with the human JAK3 and STAT5 genes to obtain a fully functional IL-2 signaling pathway. In addition, a STAT5-inducible SEAP reporter gene was also introduced. Upon IL-2 stimulation, HEK-Blue™ IL-2 cells trigger the activation of STAT5 and the subsequent secretion of SEAP. The levels of STAT5-induced SEAP can be readily monitored using QUANTI-Blue™. HEK-Blue™ IL-2 cells can be used to validate the functionality, toxicity, and variable dosage effects of human or murine IL-2. HEK-Blue™ IL-2 cells are resistant to Blasticidin, Hygromycin, Puromycin, and Zeocin™. Cells were stimulated with increasing concentration of recombinant human and murine IL-2. After overnight incubation, the STAT5 response was determined using QUANTI-Blue™, a SEAP detection reagent, and reading the optical density (OD) at 630 nm. EC50 values are shown in the table above as mean ± SD. Cells were stimulated with various human recombinant cytokines; 1 ng IL-2 and 10 ng/ml IL-1β, IL-4, IL-6, IL-18, TGF-β, TNF-α, IFN-γ, and 1x104 IU/ml IFN-α, IFN-β. After overnight incubation, SEAP activity was assessed using QUANTI-Blue™. 2 x 1 ml HEK-Blue™ CLR Selection (250X concentrate); a solution containing several selection antibiotics. 1 ml of QB reagent and 1 ml of QB buffer (sufficient to prepare 100 ml of QUANTI-Blue™ Solution, a SEAP detection reagent). Interleukin-2 (IL-2), also known as T cell growth factor, is mainly produced by activated T lymphocytes following antigen stimulation. This secreted cytokine plays an important role in immune activation and homeostatis [1,2]. Specifically, IL-2 plays dual roles by inducing natural killer cells as well as promoting the differentiation of naïve CD4+ T cells into regulatory T cells (Treg) cells. Interestingly, IL-2 has been approved for use as a high‑dose immunotherapeutic agent against cancer . Additionally, research indicates that IL-2 has potential as a low-dose therapy for autoimmune diseases. IL-2 exerts its action by binding to the heterotrimeric IL-2 receptor (IL‑2R), consisting of IL-2Rα (CD25), IL-2Rβ (CD122), and the common interleukin chain, IL-2Rγ (CD132). 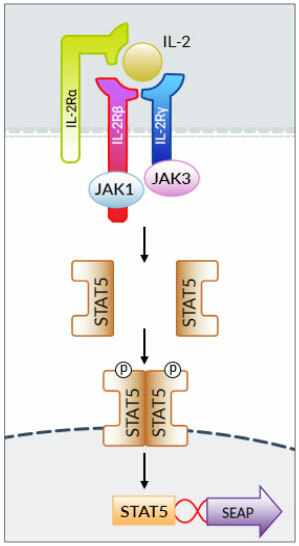 This binding leads to the activation of a signaling cascade through tyrosine kinases of the Janus family (JAK1 and JAK3) and signal transducer and transcription activator 5 (STAT5), which initiates transcriptional elements and regulates the expression of IL-2-inducible genes. 1. Choudhry H. et al., 2018. Prospects of IL-2 in Cancer Immunotherapy. Biomed Res Int. 2018:9056173. 2. Boyman O. & Sprent J., 2012. The role of interleukin-2 during homeostasis and activation of the immune system. Nat Rev Immunol. 12(3):180-90.